As a retailer and distributor of batteries we provide a free collection bin for you to recycle your used household batteries. Please be aware that used batteries should be taken to your nearest recycling point in person and must not be sent in the post. 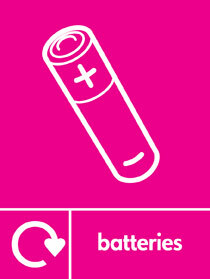 To find your nearest battery recycling bin visit www.batteryback.org or www.recyclenow.com, who provide a list of retailer and local authority collection points. Our battery recycling bin is located in our warehouse at our premises in Lane End. If you live nearby then please bring your used batteries and we will arrange for them to be recycled. When you recycle your batteries they’re taken to high tech plants that break down the batteries into their various materials. The materials recovered depend on the battery type but commonly these recycling plants are able to recover steel, nickel, zinc and lead. These materials can then be used again to make something new. In addition to recycling batteries we are also part of the Recolight light bulb recycling scheme.